VANCOUVER, B.C. – June 4, 2012 – The number of properties listed for sale continued to increase in the Greater Vancouver housing market in May. The number of sales decreased year over year, but remained relatively constant compared to recent months. The Real Estate Board of Greater Vancouver (REBGV) reports that residential property sales in Greater Vancouver reached 2,853 on the Multiple Listing Service® (MLS®) in May 2012. This represents a 15.5 percent decline compared to the 3,377 sales recorded in May 2011. 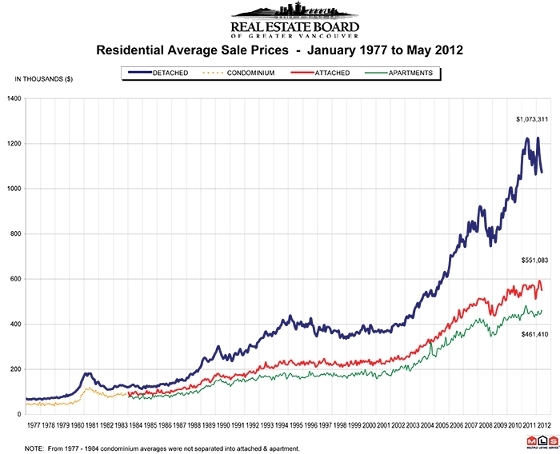 New listings for detached, attached and apartment properties in Greater Vancouver totalled 6,927 in May 2012. This represents a 16.8 percent increase compared to May 2011 when 5,931 homes were listed for sale and a 14.4 percent increase compared to April 2012 when 6,056 homes were listed for sale on the region’s MLS®. Last month’s new listing total was 15.3 percent above the 10-year average for listings in Greater Vancouver for May. At 17,835, the total number of homes listed for sale on the region’s MLS® increased 7.9 percent in May compared to last month and increased 21 percent from this time last year. The MLS® HPI benchmark price* for all residential properties in Greater Vancouver currently sits at $625,100, up 3.3 percent compared to May 2011 and up 2.4 per cent over the last three months. The benchmark price for all residential properties in the Lower Mainland** is $558,300, which is a 3 percent increase compared to May 2011 and a 2.3 percent increase compared to three months ago. Sales of detached properties on the MLS® in May 2012 reached 1,180, a decline of 24.8 percent from the 1,570 detached sales recorded in May 2011, and a 6.1 percent decrease from the 1,256 units sold in May 2010. The benchmark price for detached properties increased 5.1 percent from May 2011 to $967,500. Sales of apartment properties reached 1,156 in May 2012, a decline of 5.9 percent compared to the 1,228 sales in May 2011, and a decrease of 14.6 percent compared to the 1,354 sales in May 2010.The benchmark price of an apartment property increased 1.7 percent from May 2011 to $379,700. Townhome property sales in May 2012 totalled 517, a decline of 10.7 percent compared to the 579 sales in May 2011, and a 5.3 percent decrease from the 546 townhome properties sold in May 2010. The benchmark price of a townhome unit increased 0.9 percent between May 2011 and 2012 to $470,000.